The smell of Lysol, crying babies and sterile walls… Chatter in the hallways, mediocre food, beeping IV machines and sleepless hallways… This would be horrible if it wasn’t for the amazing doctors, nurses and staff members at Cincinnati Children’s Hospital who have made a point to make us as comfortable as possible. Joey has been put under three times in the last week for different injections, MRIs and other tests. We don’t have any real answers at this point. But I do have good news. Something worked today… He has ZERO pain right now. He has not screamed out once since the steroid injection this afternoon. He has not had a shooting pain and the aching pain in the hip is gone. For the first time in weeks, he let someone touch his hip and thigh without screaming out. He actually let holistic care massage the area. He even wobbled to the bathroom without crutches but assistance from me. This might not sound like much to most people but this was HUGE. He has not let that foot touch the ground for weeks. As of now, the doctors are talking about transferring Joey to the in-patient rehab center so they can get him walking again. This plan could change if the pain returns. Pray that it doesn’t. As long as things don’t change much, I am going to go to DC with Andi. My incredible friends and family have promised to care for Joey while I’m gone. I am so lucky to have so many amazing people in my life. Be sure to like my Facebook page and click “follow” on the blog so you can continue to get updates. Joey loves reading your messages of encouragement so keep them coming! How do you choose between children? I have two children. I have an almost 14-year-old daughter who is finishing up her last year in middle school and an 11-year-old son who is finishing up his last year of elementary school but is in the hospital. My daughter’s 8th grade class leaves for DC tomorrow night and I’m supposed to be on that bus. But my son… What do I do? My son Joey is in the hospital with unexplained shooting pain in his leg and refuses to put weight on his leg. Doctors are doing test after test to try to figure out what’s going on. I have stayed with him around the clock. 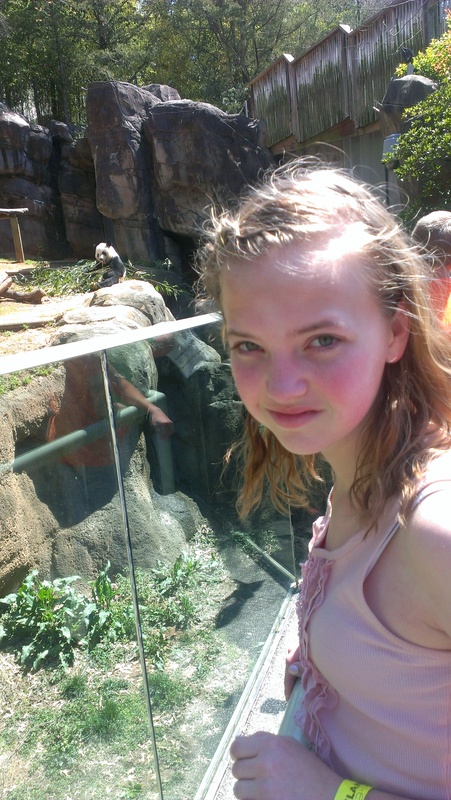 My daughter Andi has been passed among family members and friends for the last two weeks. Her routine has been a mess. The last year has been hard on all of us since Joey’s diagnosis of LCH and his hip bone graft. I was looking forward to having time away with her and seeing her have fun with her friends. Joey will probably be at Cincinnati Children’s the rest of the week. They are talking about admitting him to physical therapy rehab so they can get him walking again. This is assuming they find nothing serious in the testing today. I would obviously stay if they find something serious. But I have friends and family who are willing to stay with him around the clock if I go to D.C.
Not only would a lot of money be lost (did not get insurance on trip – duh! I know) but my daughter would be upset if I didn’t go. Plus she’d worry about her brother. She would try to understand I need to be with him but she is only 14. I know if I go and something happens, I could jump on a plane immediately. We know that the Histio is not back and that it is not life-threatening. So the chances of a big emergency happening are pretty slim. It might not be the Walking Dead but I am surrounded by zombies. Although there are a few male zombies, they are mostly female zombies. Their hair is matted and ratty or pulled back in a messy ponytail. They have dark circles under their eyes. You can tell by looking at them that they don’t sleep. Their skin is dry. Their clothes are wrinkled and maybe even a little stained. These aren’t your traditional zombies though. They aren’t going to try to bite you… well probably not. But they might just grunt when spoken to. They might snap sharply at others if agitated. And they will go crazy if they don’t like the way you treat their young. These zombies are really moms (and some dads) who are staying at Cincinnati Children’s Hospital Medical Center with their child. At the time I’m writing this, I have been at Children’s Hospital with my son for 48 hours. This will be our third night staying at the hospital. Joey screams out every few minutes in pain. It takes a lot to get him to sleep and he doesn’t sleep well. Doctors and nurses come in throughout all times of the day and night so no one sleeps more than an hour or two without interruption. 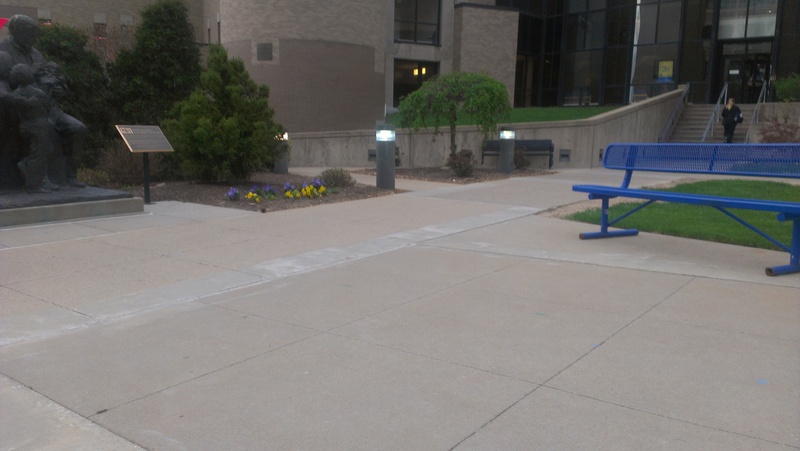 I find refuge by walking the halls, eating outside and walking the campus when someone is able to give me a break. I am lucky to have family and friends to help. I see other parents staying day in and day out with no one to relieve them. Their break consists of walking to the patient kitchen for a cup of coffee or juice. My favorite place on Children’s campus. No matter if you get a break or not though, you can tell who the parents of the ill child are. You can tell by the hair, dark circles, wrinkled clothes and the constant look of worry. We see each other in the hall and give each other or nod or a smile to let the other know we understand. It’s an immediate bond. I don’t want to run from these zombies; I want to hug them. The last few weeks have been very emotional – happy, sad, reflective – for my family. It was this time last year that we were trying to find out what was wrong with Joey. He was in extreme pain and we were not getting answers. He went from having pain similar to a pulled muscle to not being able to get out of bed within a few weeks. It all started sometime in March but it wasn’t until the end of April that we were told he had Langerhans cell histiocytosis (LCH). Prior to diagnosis, I already had Joey using crutches to get around and the elevator at school because it was obvious that something was seriously wrong. 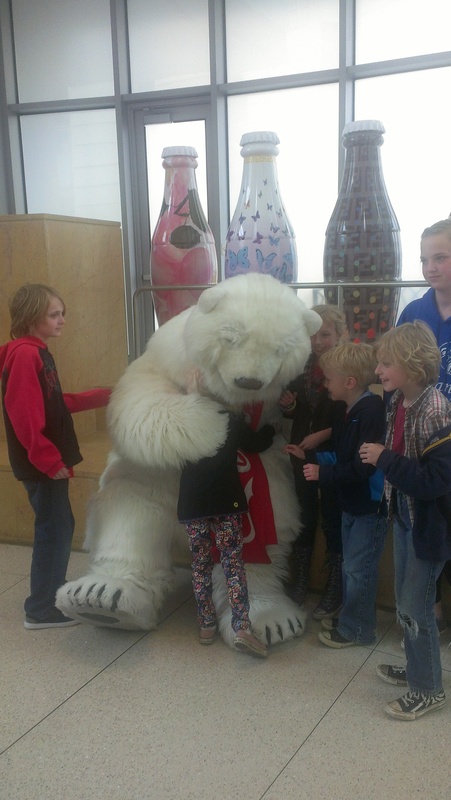 Once he was diagnosed at Cincinnati Children’s Hospital, things moved quickly. We were given the news on a Monday and he had a biopsy and bone graph of his hip on a Wednesday. We would never know our old “normal” again. Joey spent several months in a wheel chair and couldn’t finish the last two months of school. Then he moved to a walker, crutches and then finally on his own.So we have just past the time when all the pain started one year ago and we are quickly approaching the one-year anniversary of his surgery. There hasn’t been a day that has gone by in the last year that Andi, Joey or I haven’t thought of Histio and the way it has impacted our lives. But it’s been more evident in the last few weeks, especially as we celebrated Easter and explored Atlanta on Spring Break. Joey ran through my parents’ yard collecting his eggs. He had no issues getting up and down the hill. 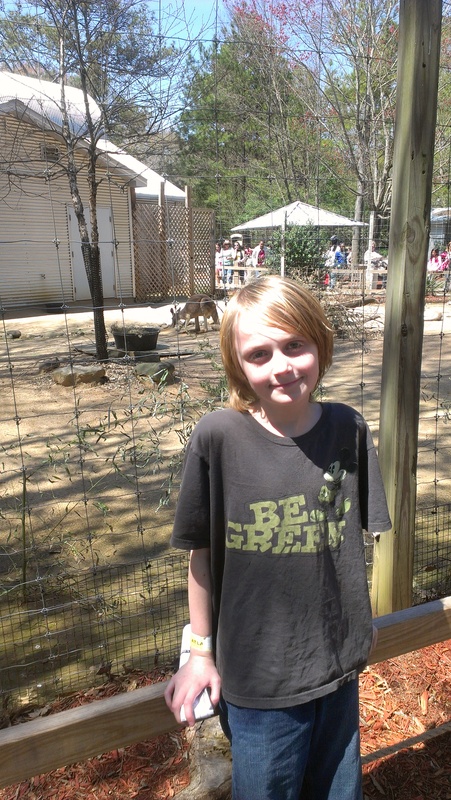 In Atlanta, he hiked down Stone Mountain and played on all the rocks. He then did an obstacle course and rock climbed. 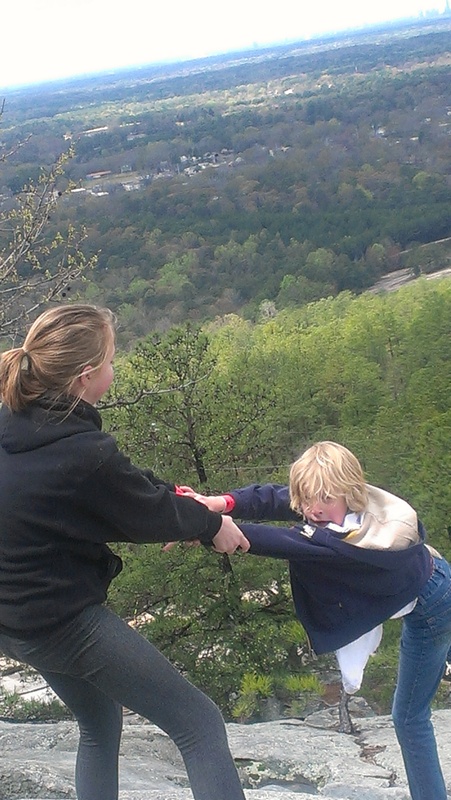 I sat on the mountain for a while watching him goof around with his sister and friends. 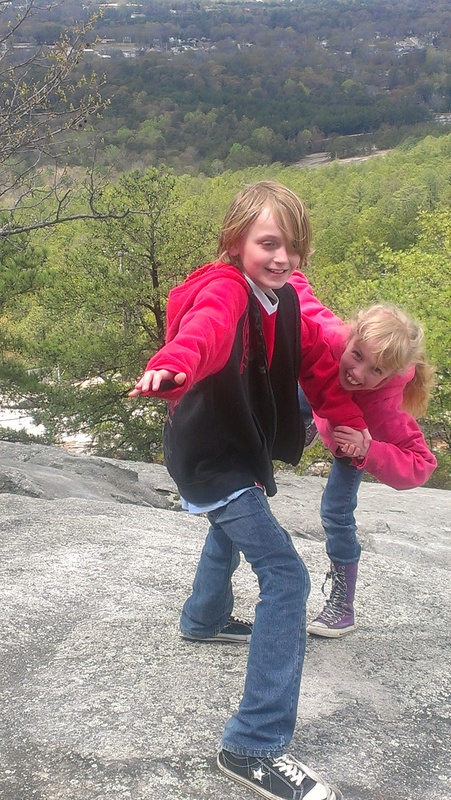 They posed pictures acting like they were falling off the cliff and jumped from one rock to the next. I felt tears build up in my eyes and eventually run down my face. Could this possibly be the same kid who couldn’t walk up the street, was in a wheelchair less than a year ago, who needed a stair lift to get out of the house and couldn’t get out of bed on his own? 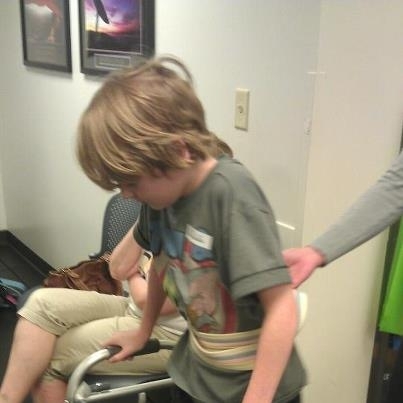 Is this really the child who has a rare cancer-like disease and was told only a year ago that he might not be able to walk again? Could this be the boy who has a “fake” hip?You know, although it was definitely Joey climbing all over that mountain, it wasn’t the same boy from a year ago. That boy, that sick little boy whose world had been turned upside down in an instant, that boy who was sad and helpless, that boy was gone. The boy I watched climb the mountain was a brave, healthy boy who overcame a major challenge that was thrown his way a year ago. My family will never know our old “normal” again but we have definitely found our new normal together and we will continue to do so as new challenges are thrown our way. Since the one-year anniversary is coming up, Joey will have new scans, blood work and tests next week. This is a proactive measure since we don’t want the Histio to sneak back up on us. I don’t think that will be an issue though. I think Joey, his sister Andi and I will be celebrating Joey’s clean bill of health next Thursday night! The kids and I would love to read your thoughts about all of this and hopefully some encouraging words here in the comments. We spent spring break in Atlanta, Georgia with good friends of ours. They just moved to Atlanta in December for a job so they had not had a chance to explore the city yet either. We had been talking for months how we wanted to see Coca Cola, the Atlanta Aquarium, CNN, the Atlanta Zoo and Stone Mountain. We were so excited to discover our spring breaks were the same. Everything goes better with coke… Even good friends. 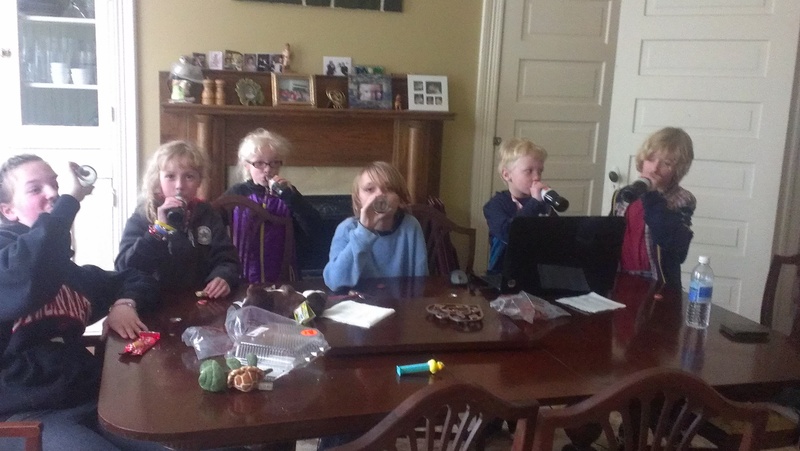 My two kids are very close to their four kids – Holland, 11, Roman, 10, Elliot, 8 and Winston, 7. 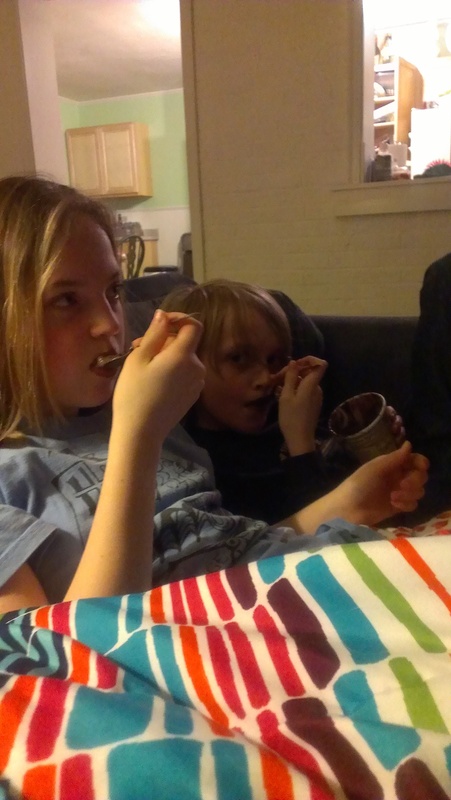 I think of these kids as my own and am very close to their parents Deacon and Amanda. So the day after Easter, the kids and I loaded up the car early morning and headed to Atlanta. We made it to their home in the small historical town of Newnan by dinner time. With several stops, it only took us 8 hours from Northern Kentucky and they live a little south of the city. We did pack lots of snacks and had a picnic lunch at a rest stop in Tennessee. Day 1: We packed up the six kids ranging from 7 to almost 14 and the cooler with lunch inside and headed to Grant Park. 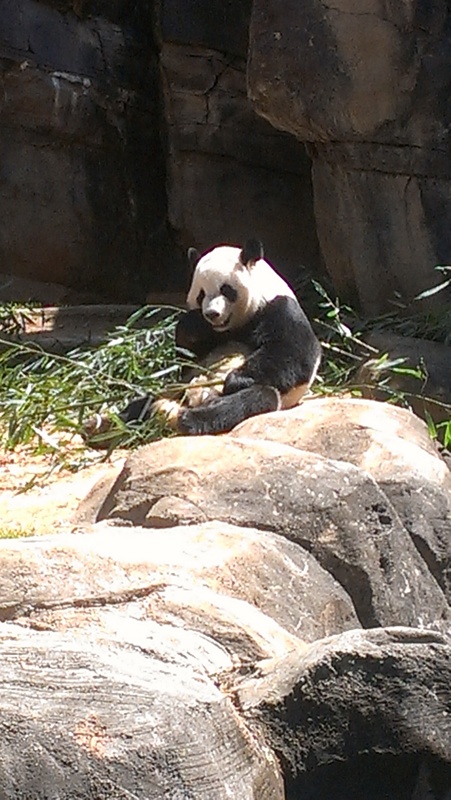 We had lunch at the park and then walked over to the Atlanta Zoo. 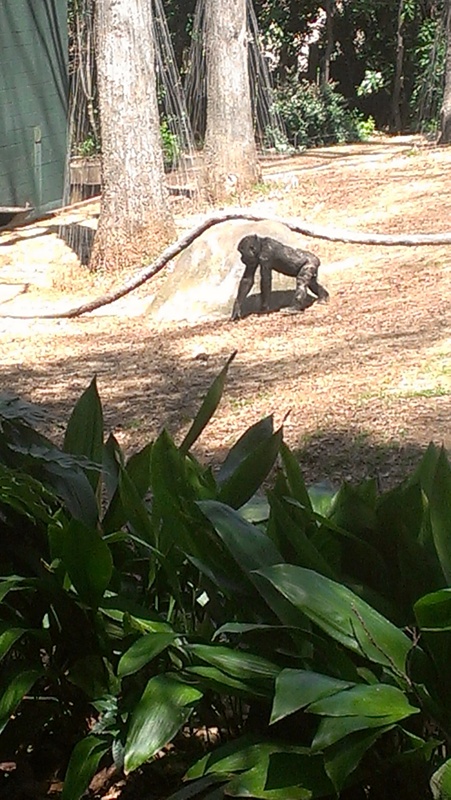 This zoo is smaller than the Cincinnati Zoo but honestly, I liked it better. 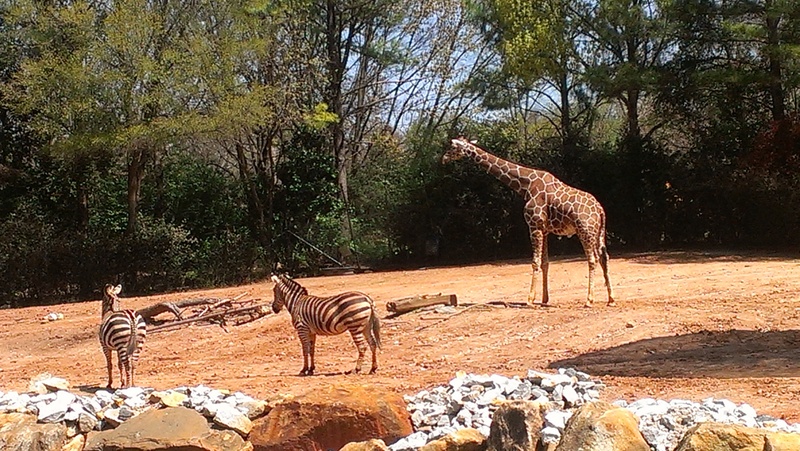 The exhibits are all very close to the viewing the area so you get a much better look at the animals. 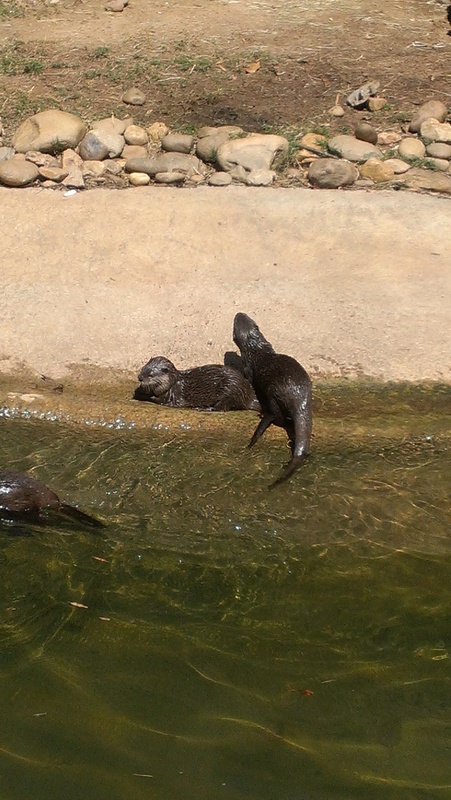 They had adorable otters, kangaroos, several gorillas and panda bears, which is something I had never seen before. 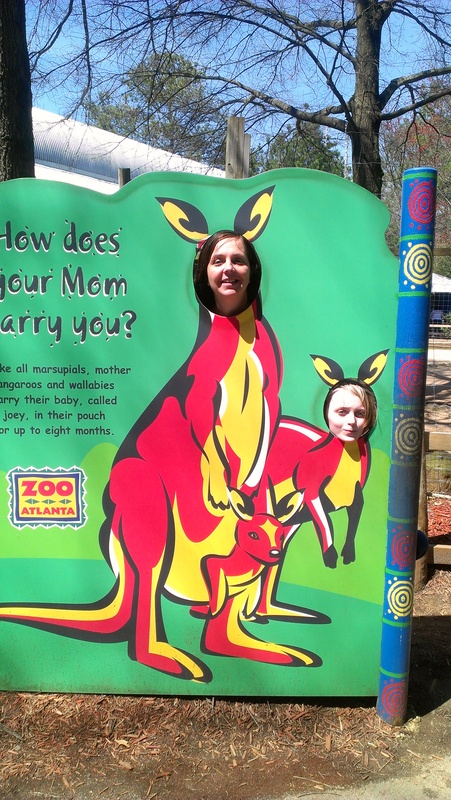 I was super excited about the kangaroos and pandas since my children have always been Joey, the baby kangaroo, and Andi Pandi, the panda bear. 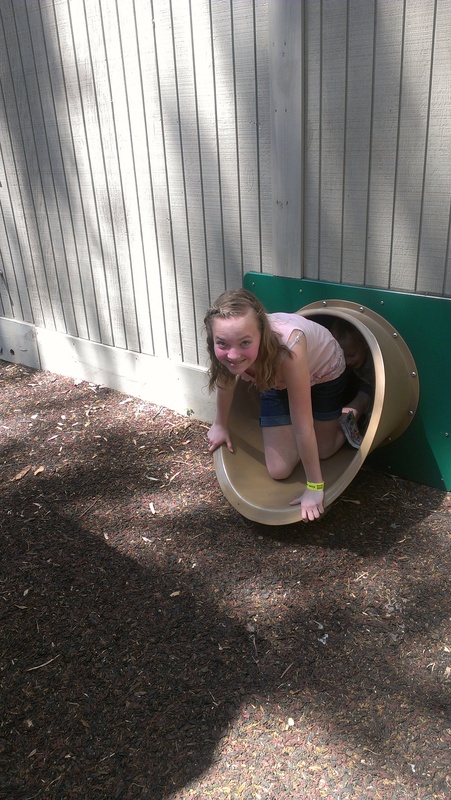 After spending a few hours watching the animals play and petting the goats in the petting zoo, we spent a half hour or so at the playground. 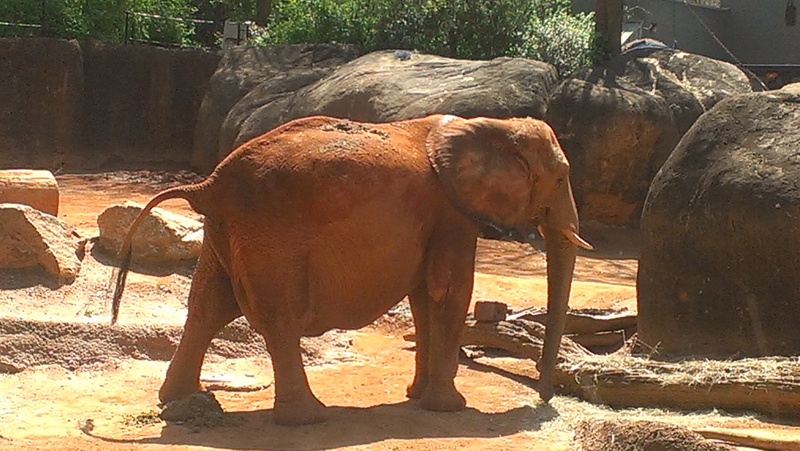 The Atlanta clay gives the animals an orange tent. We drove about a half hour to the MARTA train station and took a train downtown. It cost $2.50 per person versus dealing with traffic and paying $10 to $20 to park each car downtown.The kids were very excited about the train experience. 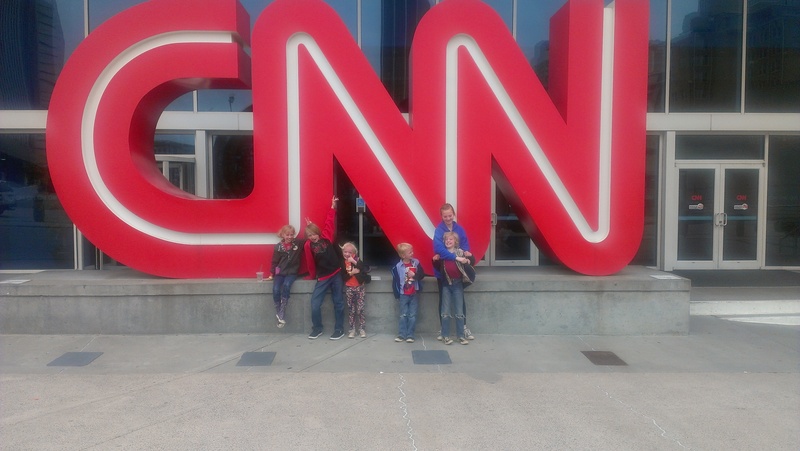 We then walked a few blocks to CNN where we were able to tour the station. I’ll be honest. This was not what I expected at all. I have toured NBC in New York, which was awesome so I assumed this would be similar but it was not. We really only saw people on their computers from a viewing area. Needless to say, the kids were bored. The courtyard at the CNN center offered plenty of food choices so we had lunch there. 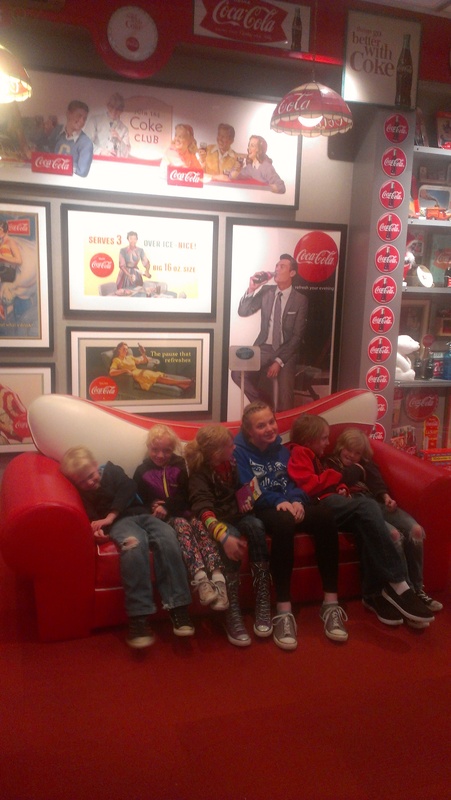 We then walked a few blocks to World of Coca Cola. The tour starts off with a short presentation and a really goofy animated short-film (this was weird). Then you are on your own to see the Coke artifacts, how Coke is made, the history of Coke and then to taste more than 60 types of Coke. It is amazing how different it tastes from different parts of the world. My favorite was the one from Georgia, Europe. I was disappointed in the Italy flavor as well as many others. It was definitely a fun experience though. We then hopped back on the train and headed back to our cars. This is where one of the funniest things of the whole trip happened – well at least we find it funny now. The train was very crowded since it was rush hour. Amanda and Winston were sitting pretty far from the rest of us. Elliot was on my lap and the other four kids were standing near me holding on to the poles. A man boards the train, looks around and yells “Attention, Attention everyone!” Right then I thought “OMG, this is it. He’s going to shoot us all or he’s going to rob us.” He continues “I see a lot of sad faces on this bus and life is just too short to be sad all the time.” And I see the kids’ faces and realize they are all thinking the same as I am. 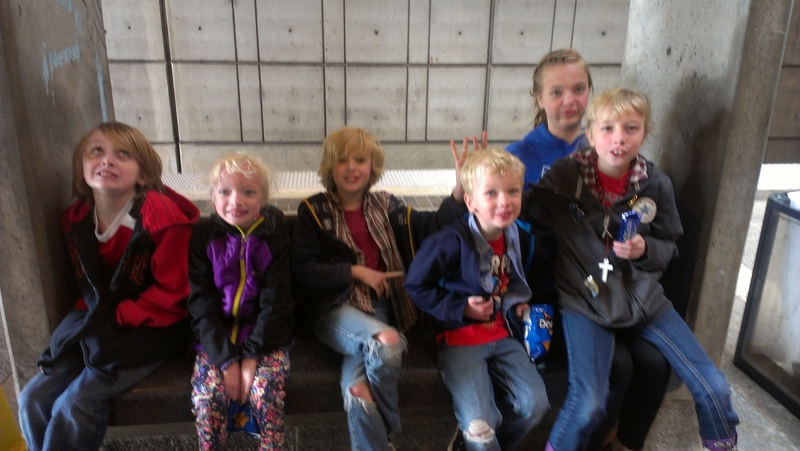 I think “how can I cover all five of these kids at once and protect them.” Then he continues “so I want to see everyone smile.” Oh my goodness, I think everyone on the train smiled right at that moment out of relief that we weren’t being held up. We took the train downtown again and started to walk to the Atlanta Aquarium. But it was freezing and raining out so I hailed down a cab. WARNING: ask the cab driver what it’s going to cost immediately. He did not run the meter and then charged me $24 for taking us a mile. According to Taxi Fare Finder, it should have cost about $9. But it was almost worth it because none of the kids had ever been in a taxi. You would have thought it was Christmas by how excited they were. 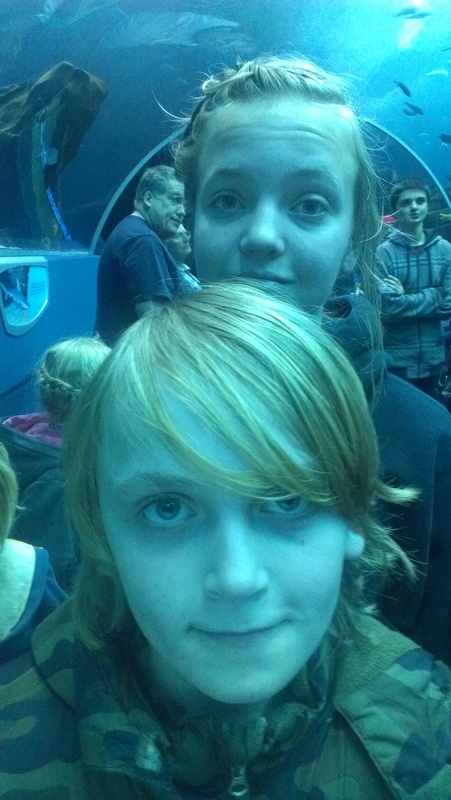 Andi and Joey at the Atlanta Aquarium. 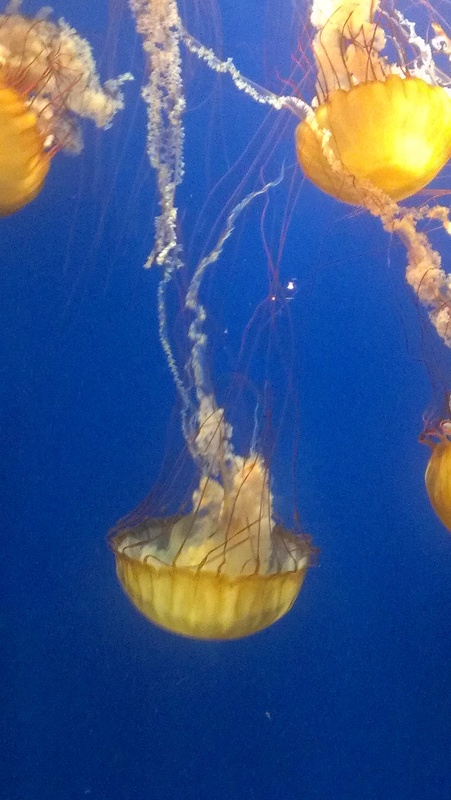 This is one of the largest aquariums in the world. The exhibits were amazing. 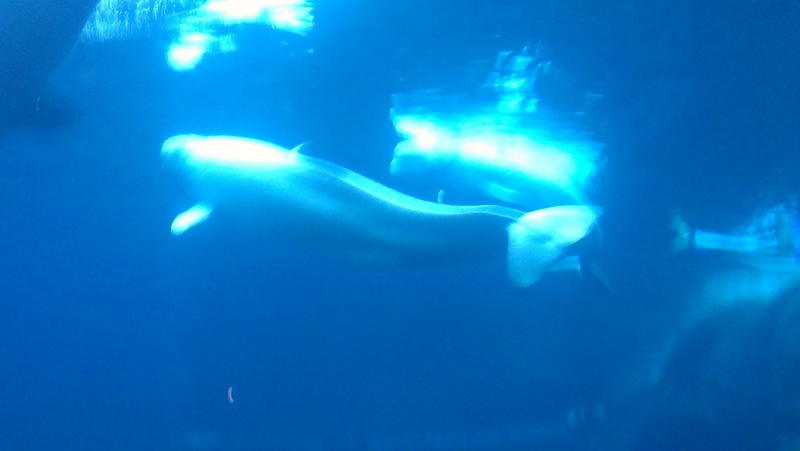 I loved watching the Beluga whales, the otters and the penguins. We arrived around noon and immediately asked for tickets to the dolphin show. We couldn’t see it until 5:30 because the other shows were sold out. There was no way all these kids were going to make it that long. By the time we would watch the show, take the train and then drive back, it would be 8 p.m. or later. I was extremely disappointed I did not get to see the dolphin show. It was more disappointing that we didn’t even get to see the dolphins because apparently you can only see it at the show. So my advice would be to get there when it opens to get tickets to the dolphin show. 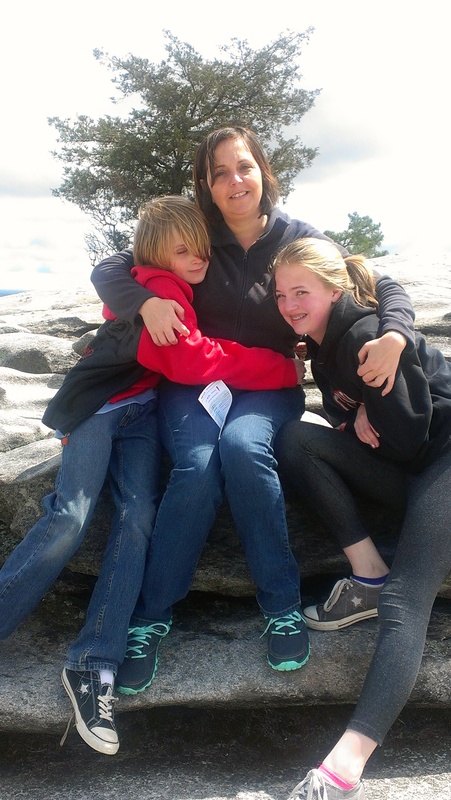 I loaded the car with lunch and the four older kids to head about one hour away to Stone Mountain. It was very easy to get to and we were able to buy a one-day parking pass for $10. We had bought our adventure passes (admission to all the activities at a discounted price) in advance. We headed straight for the Summit Skyride. 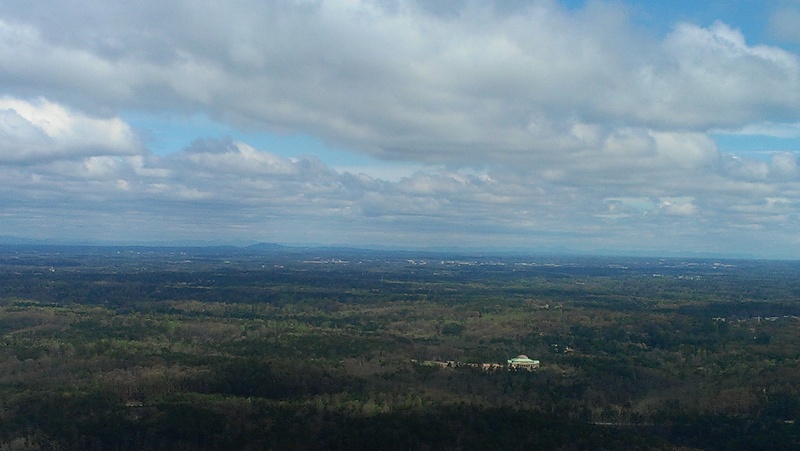 It took us to the top of Stone Mountain, which was breathtaking. 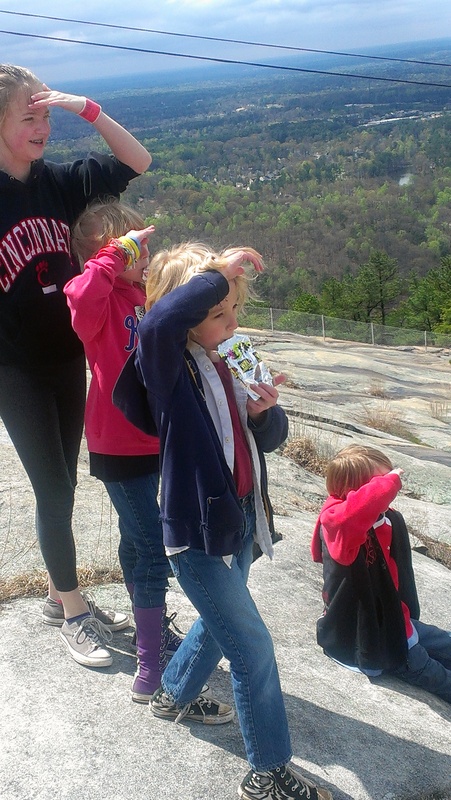 We started exploring the side of the mountain stopping to take in the view of Atlanta several times. 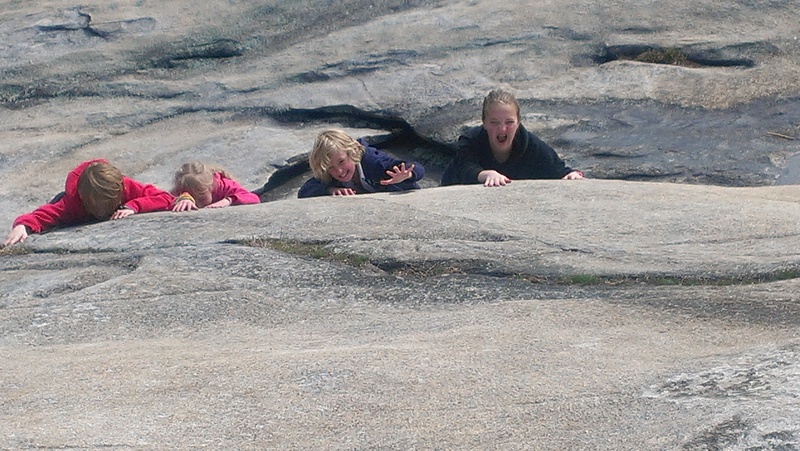 The kids had a blast playing on the rocks. We eventually hiked our way down the mountain. They say it takes about 35 minutes at a normal pace but since we stopped and played so much, it probably took closer to 90 minutes. Andi “saves” Roman from falling off the cliff. What they don’t tell you is if you hike down, you will be about one mile from the adventure area and your car. So after a long walk, we decided to rest our legs by riding the train. The 35 minute ride around the park was very relaxing and informative. 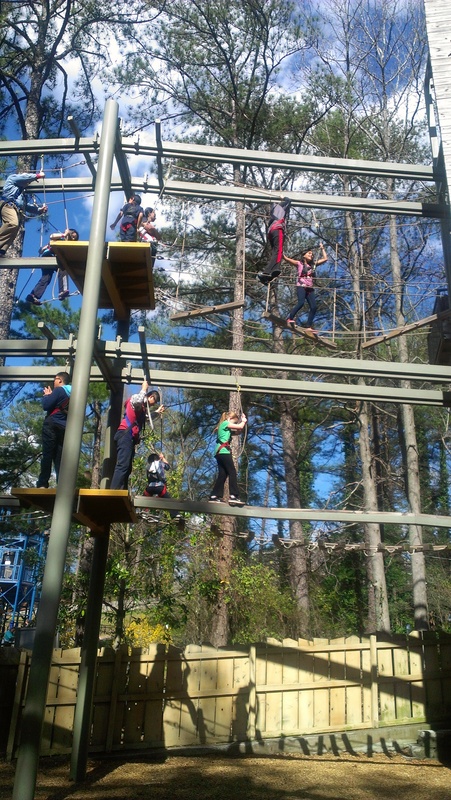 The next stop was the SkyHike where we did an obstacle course 64 feet off the ground. We walked over narrow, moving planks, tight ropes and other obstacles while harnessed in. I nearly had a panick attack so bad on one obstacle that an employee was coming over to save me. Luckily I made it across before he had the chance since my kids would have never let me live that down. Although it was scary, it was totally worth it and I would do it again. After that, the kids rock climbed and then cooled down with Geyser Tower. I did this! Those beams move! This really was an amazing trip. I do have a few tips for you if you plan to visit Atlanta. 1. Buy the Atlanta CityPass. It includes five of the major attractions and allows you to save over 40%. This really made the trip affordable. This pass also helps you avoid some lines. 2. 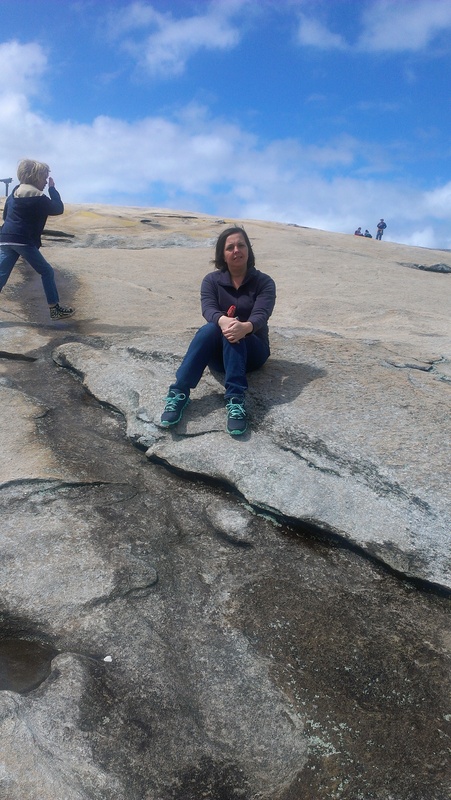 Buy the Adventure Pass at Stone Mountain. You will cover the cost if you choose even two activities. 3. Avoid Atlanta rush hour if possible and note that rush hour is from 7 a.m. to 10 a.m. and 4-7 p.m. Take the train if you can. 4. Get to the Aquarium early and get your tickets to the dolphin show. 5. Every single attraction lets out through the gift shop so be mentally prepared for that with kids. 6. Check to see if you can get a discount on the city or adventure passes – they offer a discount for some companies. 7. Atlanta temps can vary so wear layers. 8. Atlanta is definitely a southern town. Everyone will say hello and calls you mam or sir. Return the southern hospitality. Have you ever been to Atlanta? What was your favorite part? Is there anything else I should have seen? Tell us about your favorite trip and tips you might have! P.S. Be sure to check us out on Facebook.